World Molecular Imaging Society (WMIS) is announcing that it will sponsor and support the Imaging in 2020 conference (i2020). i2020 is a world-class meeting of imaging professionals and researchers. 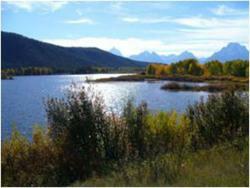 The meeting takes place in Jackson Hole, Wyoming. The 2012 meeting will take place on September 30 – October 4, 2012 and the topic of the meeting is Imaging to Explore Complex Biology. Having WMIS help us run the i2020 meeting implies getting the horsepower of the leading society in molecular imaging - and it means a lot for us. i2020 chairs and organizers are the key leaders of the molecular imaging field and include James P. Basilion, Ph.D. of Case Western Reserve University, Thomas J. Meade, Ph.D. of Northwestern, Anne E. Menkens, Ph.D. of NCI/NIH, and Daniel C. Sullivan, M.D. of Duke University. "We are thrilled to receive this vote of confidence from WMIS. Having WMIS help us run the i2020 meeting implies getting the horsepower of the leading society in molecular imaging - and it means a lot for us." Dr. Dan Sullivan of i2020 said. "This sponsorship adds tremendous prestige to our offering." Commenting on the conference, Dr. Thomas Meade of i2020 said "Last year we introduced the powerful topic of exploring the link between molecular imaging and emerging therapies. In 2012, we are focusing on Imaging to Explore Complex Biology. Once again, we are committed to showcasing the deep insights and sophisticated research of our speakers and participants. The molecular imaging field is expanding rapidly and it can add tremendous value in studying complex biology. Many researchers are still unfamiliar with the role Molecular Imaging can play in studying complex biology. In i2020 of 2012 we will provide powerful examples and a clear vision for the molecular imaging in complex biology." "Imaging 2020 can be viewed as a focused single-topic follow-up meeting that builds upon the latest and broad findings that are reported in our main, World Molecular Imaging Conference (WMIC), event." said Dr. Juri Gelovani, President of WMIS. "We are excited to support the i2020 conference. We employ a federated approach to scientific program development, which is exemplified by our annual meeting, WMIC. We are proud to expand our footprint and scientific breadth by helping to manage and organize other imaging-related satellite meetings." Dr. Gelovani added. WMIS is the world's most innovative and leading society in molecular imaging and molecular medicine. With the rise of the molecular imaging industry and the associated research, WMIS is the only organization that is connecting all the dots in the industry and is working to bring all stakeholders together by Smashing the Silos and Leading Innovation Convergence in molecular medicine; both for practitioners and researchers, who are defining the future of molecular imaging, WMIS enhances the potential and applications of innovation. WMIC is the world's most innovative, science and technology led, event. It brings the world's top molecular imaging scientists, technology experts, researchers, and business leaders together to define the future of the molecular imaging field. As the most exciting event in the field, it attracts participation from across the entire value chain of molecular imaging. WMIC 2012 will be held in Dublin, Ireland on September 5-8th, 2012. It is expected to be a power-event that will attract companies and institutions from Europe, Asia, Middle East, and Eastern Europe. I2020 Imaging in 2020 seeks a clear vision of next-generation imaging developments and aims to set the agenda for the field for the next decade. Our goal is to facilitate open and effective communication among basic and clinical researchers from many different fields. The location and format of this meeting have been selected to allow ample opportunity for interaction among colleagues, in the hope that unique and productive collaborations will be formed. The overall goal of Imaging in 2020 is to catalyze this communication by laying the technical foundation for assembling several investigators from varying disciplines and by providing a format that is intentionally less structured than the traditional scientific meeting, allowing for extensive, meaningful interactions in a casual, comfortable environment. We foster the development of enduring associations that will lead to innovative solutions and applications. One of the explicit goals of Imaging in 2020 is to bring together investigators from diverse backgrounds. These individuals would not normally interact at the professional meetings that they typically attend. Since 1999, Imaging in 2020 has a proven track record of stimulating cross-fertilization of ideas and concepts, and generating new collaborations across subject matter areas as well as geographical areas across institutions. Typically, there are 23-26 speakers (no concurrent sessions) with rigorously enforced time limits for presentations. The discussion time is equal to the presentation time and this format encourages attendees to participate in meaningful discussions.